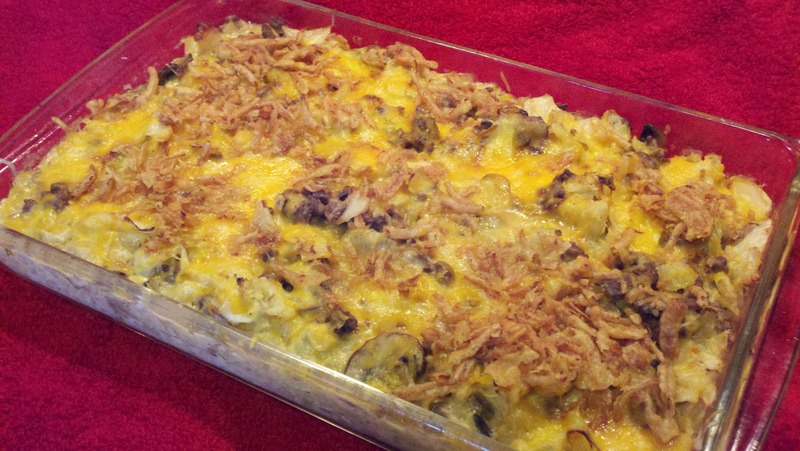 If you know me, you know how much I love a delicious casserole that's easy and comforting. Those were the exact words that came to mind when Claire sent me this recipe that she had found. I love beef, I love cabbage and I love cheese...sounds like a winner to me! The original recipe didn't call for the french fried onion ring topping, but I always feel like a little crispy on top is a good thing. Another little change I made was that it was supposed to be baked in a pie plate, but like I always say, "More is more!" so I tweaked the amounts and baked it in a larger casserole dish. What can I say? When you grow up having 10 siblings, you get used to cooking for a larger crowd! So there you have it. Try it the next time you want something homey and comforting. It'll definitely hit the spot! Brown the hamburger, celery, and onion in a very large nonstick skillet or wok; drain the fat. Add the cabbage and butter; cook until the cabbage starts to wilt. Add the mushrooms and cook until the cabbage and mushrooms are very soft and start to brown slightly. Season with pepper, salt and garlic powder to taste. Add the thyme, broth, and cream; bring to boil and cook on high, stirring occasionally, until reduced and thickened. Watch closely so it doesn't boil over or evaporate completely. Remove from heat. Stir in the cheese, then the beaten eggs. Pour into a greased 9x13 glass casserole dish. Bake at 350º for 20 minutes.Remove from oven. Top with extra cheese and french fried onion rings. Return to the oven for another 10 minutes until the cheese has melted and the onion rings are crispy and golden. Let it stand for 10-15 minutes before serving. Whenever I make a casserole, I always wind up going a little heavier with the veggies, hence baking it in a larger casserole. (I even thought about adding sliced carrots.) In this case, the original said to add only one rib of celery and only 2 tbs of chopped onion. I prefer to use the whole onion, rather than having any of it leftover, only to be wrapped up and forgotten in the bottom of the crisper drawer of my fridge. Is that scenario familiar to anyone else or am I the only one who does that?